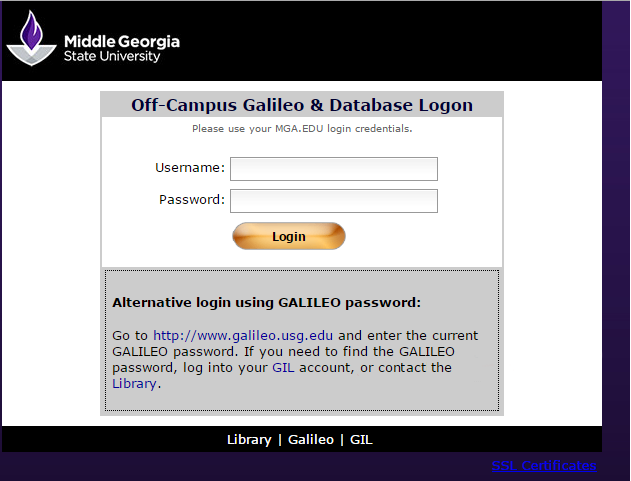 You can access GALILEO and most other online Library resources from off-campus by logging in with your Middle Georgia State e-mail username (firstname.lastname) and password. Contact the Library at 478.471.2709 if you have problems accessing library resources from off-campus. If you don't know your Middle Georgia State e-mail username and password, please call the Technical Assistance Center at 478.471.2023. Click one of the following headings to learn more. Who can have off-campus access to library resources? Off-campus access to library databases and resources is primarily available to currently enrolled students, faculty and staff. Members of the community cannot get access to our resources unless they are on campus. How do you get off-campus access? As an alternative route, off-campus access to GALILEO can also be achieved with the GALILEO password. The password changes every semester and can be looked up by logging into your GIL account or on the opening page of Brightspace/D2L.